Ghulam Ali was born to a family of horse traders hailing from the Bangash tribe of Afghanistan. The family became full-time musicians and settled in the royal court of Rewa in Rajasthan. Although disputed, he was probably the son of Hyder Ali Khan and the grandson of Ghulam Bandagi Khan Bangash, one of the original migrants from Afghanistan, both of whom were Rabab players. Ghulam Ali grew up to be a fine musician and performed extensively in the courts of Gwalior, Bundi and Jaipur. Later he moved to Shahajahanpur. He is said to be the first creator of the Sarod from the Afghan Rabab. 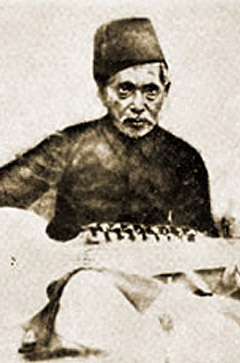 The eldest son of Ustad Ghulam Ali Khan, Hussein Ali was born circa 1802-03 in Rewa. He learned Sarod and Sur Shringar from his father –the Sur Shringar having been invented by Zafar Ali in the 1820’s. Among the three brothers (Hussein Ali, Murad Ali, and Nanhe Khan) Hussein Ali created the Sur-Chain during the 1830s. 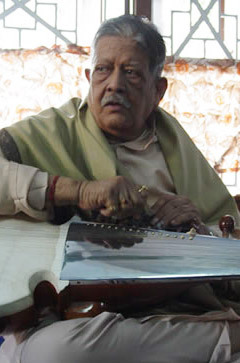 He trained his son Asgar Ali on Sarod, Sur-Shringar and Sur-Chain. Both father and son were very famous and commanded deep regard in the music fraternity for their incredibly melodious finger tips which had been compared to the finest sound of a flute. Asgar Ali had no children, therefore, there were no descendants of this line. The second son of Ghulam Ali Khan, Murad Ali was born circa 1810-11, most probably in Rewa or Gwalior in Rajasthan. During his childhood, his father moved from Rewa in Rajasthan to Shahjahanpur. 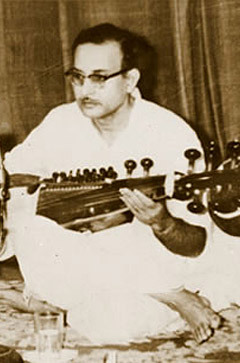 Murad Ali was the first person to use a steel fingerboard on the Sarod that was created by Ghulam Ali. Along with his elder brother Hussein Ali, he introduced Sur-Shringar and Sur-Chain to this Gharana. A prolific composer, he created many Gats, some of which are still heard even today. He is respected for being the ‘renovator’ of Rezakhani, Ferozkhani and Masitkhani compositions into their modernized and diversified form. As a sign of modesty and greatness, he did not take the opportunity to be named as the composer of the Muradkhani Baaj as it is known now. He always attributed his creations to his predecessors (Ghulam Reza Khan, Feroze Khan and Masit Khan). In this clip you can hear Pt. Buddhadev Dasgupta playing a creation of Murad Ali Khan in Raga Gour Mallar. Murad Ali learned the elaborate playing style of the Veen on the Sur-Shringar in the Jaipur court from the Veenkars. During his lifetime he was tireless in shaping the full scale language of music on the instruments mentioned above. He trained his adopted son Abdullah Khan and youngest brother, Nanhe Khan. He stopped giving taalim or instruction to Nanhe Khan when the youngest brother married a court lady in Rampur, for reasons unknown. Born circa 1844-45 in Shahjahanpur, he was the adopted son of Ustad Murad Ali Khan who was childless. From his father, he received training in Sarod, Dhrupadi Rabab, Sur-Shringar and Sur-Chain (the latter two instruments having been derived from the Rabab and Veen). He was also proficient as a Sarod maker and is said to have given the shape of the modern day Sarod. He designed and made eight to nine kinds of Sarod, some of which can be found still in use today. He was proficient in all the aspects of instrumental music, including the Alaap, the long slow introduction of the Raga at the beginning of a piece and the Gatkari, the faster movements normally played with a percussion instrument like the Tabla in different tempos. He passed away in 1924 in Dwarbhanga (now in the state of Bihar in India). He was the first person from the Shahjahanpur Gharana to visit Bengal. He came to Rajshahi (in Bangladesh) and Calcutta to perform, invited by Brojendra Mohan Maitra and Lalita Mohan Maitra, the father and grandfather respectively of Radhika Mohan. 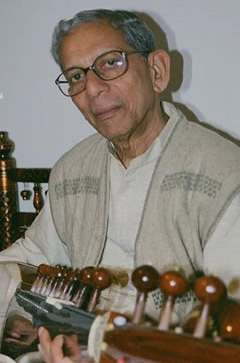 Abdullah Khan was a prolific composer in various Ragas. Some of his compositions can be heard today from maestros and students of this Gharana.